Developed more than 30 years ago. 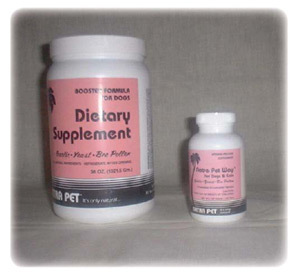 Safe and natural supplement designed to enhance skin and coat as well as health and general well-being. Very palatable. Great product! 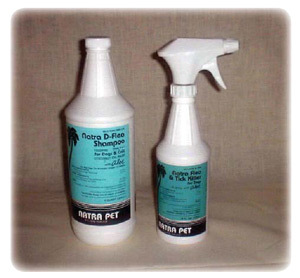 The original coconut oil-based fl ea spray and shampoo. Uses pyrethrin as a safe and effective way to treat problematic fl ea infestation. Anyone that comes into daily contact with animals, people and/or money should have a canister handy at work, at home and in a vehicle. These are the only truly disinfectant wipes available in this form. For additional economy each wipe may be used repeatedly with the same results until dry, and they are NON-TOXIC! EPA registered as a hospital desinfectant. Meets OSHA Bloodborne Pathogens Standard (29 CFR 1910.1030). This product is 100% tuberculocidal, bactericidal, fungicidal, and virucidal. Nonabrasive, non-staining, and compatible with plastics, latex, glass, metals, porcelain, painted surfaces and stainless steel. Continuous residual bacteristatic activity for over six months. Alcohol-free. Citrus scented!